No cages. No bars. No protection between me and the wild monkeys. This was certainly no zoo, which I’m totally against anyway. With trepidation, I walked cautiously through the opening gate to monkey forest, with my daughter, Zoe, hoping it was safe. An easy to walk wide pathway carved through the jungle floor. Surrounded by lush dense forest, I watched in amazement at the playful scampering monkeys darting around us and living in its natural habitat. The temperament of the monkeys seemed to differ depending on the age of the monkey. The newborns were more skittish and shyer, clinging to the underbelly of their mothers and occasionally seeing how far they could get before Mom would yank them back in to keep a closer eye. The older monkeys exhibited typical teenage disobedient behavior and tested their Mom’s patience by constantly clowning around. 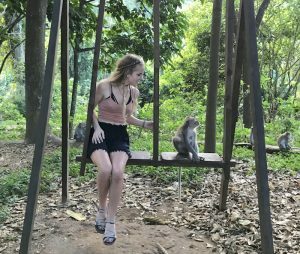 As I was just beginning to be a little more comfortable, I watched a monkey jump up on the woman’s leg who was standing just a few feet away from me and scale up her back. The monkey was ferociously working to open her backpack zipper. As she was in a bit in shock and tried to remove the backpack from her, the naughty monkey continued to rummage for a tasty snack but was unsuccessful and ultimately dashed away unable able to drag the backpack away due to its weight and size. Despite witnessing the monkeys fearless demeanor, Zoe decided to get a bit daring and bought a banana at a nearby stand and was instructed to hold the banana up above her head. A larger adult male came climbing up her body as if she was a sturdy tree and proceeded to poach himself on her head while being fed banana after banana. You can hear me say, “put your arms down”, but then I realized the monkey was using her raised wrists to keep his balance on top of her head. I was thoroughly amazed at her bravery although I could hear her voice was trembling. As we continued walking through the sanctuary Zoe grew a bit tired and sat on a nearby swing. She was soon joined by a young equally curious monkey. I quickly raised my camera to capture the photographic memory. Zoe’s head tilted over her shoulder looking down at this furry creature sitting next to her. As I was snapping away, to my dismay she extended a hand to give the ostensibly docile monkey an endearing touch. Before I could shout, “NOoooo”, my finger still snapping a series of burst shots, the not-so-sweet monkey leaped at her. Mouth wide open, teeth visible, and bite her arm slightly breaking the skin. I saw Zoe wince and her face expression quickly go from Awe to AGHHHHHHHHHHHhhhhhhhh! My first thought was glad I got my world nomad travel insurance . Then my second thought was, WAIT, what if the monkey has rabies it could be lethal?! I tried not to panic but knew medical attention and more research was necessary. I approached the staff to seek their advice. They cleaned the wound and said, “Tedak apa-apa” (Don’t worry). “There is no need to get a rabies shot or get antibiotics” the resident staff calmly spoke. According to the staff, there is no risk of rabies and all the animals are healthy. According to the Monkey Forest website, no reports of any monkeys have had rabies in the last 14 years. 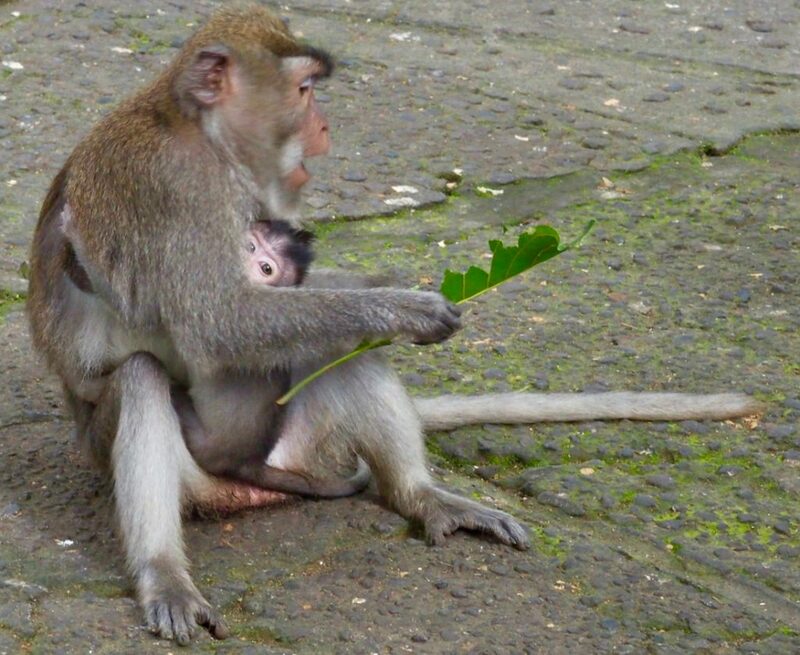 I also did not find any alternative sites that evidenced anyone having been affected by rabies from monkey forest. Rabies is extremely dangerous and if a person is bitten by a monkey (or dog for that matter) that has rabies it is almost always lethal within 10 days to 2 years so I do not wish to downplay the potential severity. Rabies is transferred by saliva. If infected, a vaccination given within six days of the infection would save your life. Despite the potential gravity of the situation I decided to do more research and not rush for medical attention quite yet. 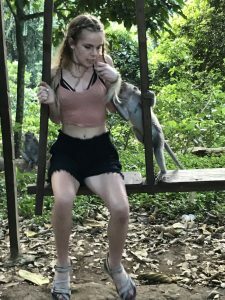 So without further ado, I’d like to further expand on why monkey forest is so special and why its a must to see when you are visiting Bali, especially because I have survived to tell about the experience. 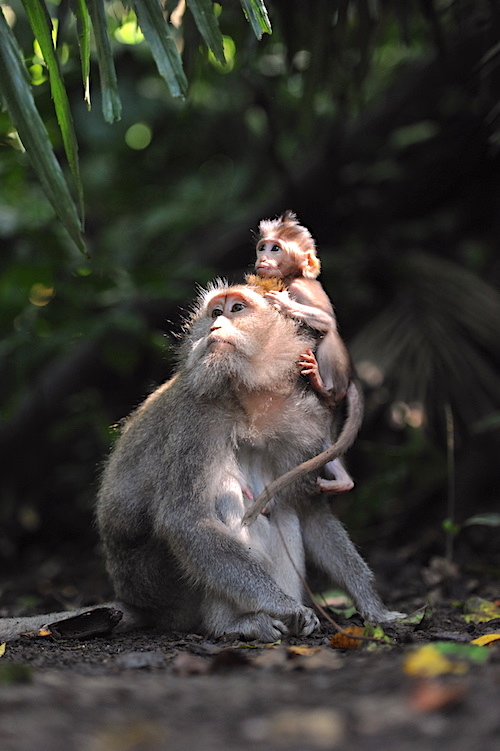 Monkey forest is much more than a monkey sanctuary where 600 Balinese long-tail macaque scamper throughout a dense jungle. No bars or cages. There are over 186 different tree species and sacred sculptures covering 27 acres to delightfully meander for hours. Three ancient temples dedicated to different gods can be found here dating back to the 14th Century. Just let that soak in for a minute. Being able to walk in a forest where civilization existed over 600 years ago. Incredible don’t you think? Indeed it is. Dragon Bridge is another unique sight with its giant dragon head at the foot of the steps and it’s long carved body arching over the bridge’s frame. Thick green moss grows along the carved details of the bridge giving it an authentic ancient look with tropical jungle roots cascading and dangling above you from giant banyan trees. The banyan tree is certainly one of my favorite trees in the world with its massive root system that can be seen above the ground and starts with just a seed in a crack of any structure or crevice. Having grown up with only the ability to see wild animals in oppressive zoos, it’s remarkable to see the sheer numbers of monkeys freely inhabit such a vast open area of almost thirteen miles. Tiny small newborn monkey babies clenching firmly riding along on their Mom’s belly. Playfully wrestling with their siblings while the Mother monkey displays constrained tolerance. The expressive behavior of the monkeys interacting was certainly pulling on my heartstrings. My face had a permanent grin as I watched with curiosity and wonder. Monkey Forest is a photographer’s playground. In order to get my national geographic photo of the year (or so I like to imagine), I laid down on my stomach with my zoom len extended and my eye peering through the viewfinder. I remember a medium size monkey began to walk towards me until he was just inches from camera lens trying to see what perhaps I was looking into. I laid perfectly still unsure of what he would do next. My eye staring through the lens at him, and he staring at the barrel of my lens looking inside at me. Slightly uncomfortable I waited while tourists began to gather around me at the whimsical scene. Next, unexpectedly the monkey jumped up on top of my head and began rummaging through my scalp as if looking for ticks. I dared not move. I wasn’t sure if he was doing me a favor or insulting my cleanliness. These monkeys are mischevious and very clever and have no fear of jumping on your back to pry open your bag to look for food. I have seen monkeys hold ransom tourist sunglasses in exchange for a banana. Do not pet or tease the monkeys. Do not bring food with you. 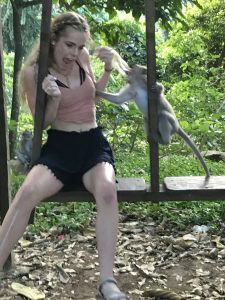 To minimize the odds of getting bitten, I would refrain from buying bananas or feeding the monkeys, however, if you are a thrill seeker like Zoe is use caution while doing so. Gates open at 8:30 am so arrive early to avoid the crowds because this is certainly one of the most popular tourist attractions in Bali and for good reason. Don’t make eye contact with monkeys it’s deemed confrontational. Hide your phone, glasses or anything that is not fixed to your body. 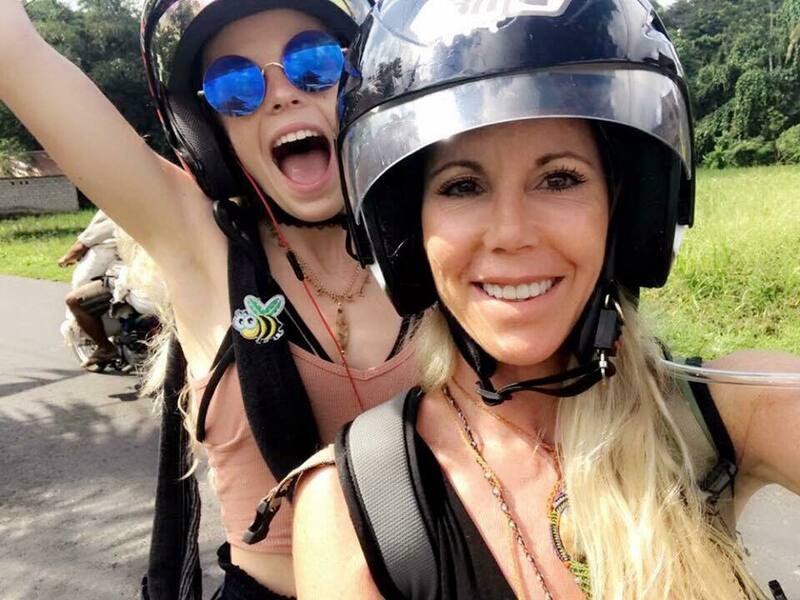 Avoid wearing flashy jewelry and consider leaving your backpack at home or alternatively if you are wearing a backpack do NOT open it while you are inside the sanctuary to avoid a monkey grabbing any of your belongings. What to do if you get bit by a monkey? I’ll begin by giving you my lawyerly response first. I am not a medical doctor I am a Holistic Health Coach and can only share my personal opinion and research findings. If bitten, seek help from one of the staff members and clean the wound thoroughly for 15 minutes. Do your own homework and if you would like to see a doctor I’ve provided the closest medical clinic from the monkey forest location below. I am not a fan of taking antibiotics so although my daughter Zoe was bitten by a monkey I did not feel there was a risk to her and did not get antibiotics or a vaccine shot afterward. Again, do your own research and consult a medical doctor to be safe. Whether a dog or monkey bites you, the same rules apply. Rabies is certainly a serious matter so as always do what you feel is best for you and your family. Injections of rabies immune globulin and vaccines as prescribed.Tetanus prophylaxis and antibacterial treatment when required. Follow-up for completion of the vaccine program and wound care. 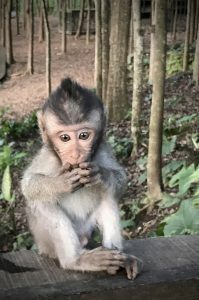 With all of this talk of rabies, you might be dissuaded to go to monkey forest, but putting aside the notion that yes rabies is deadly, there are no known cases of rabies from a monkey bite in monkey forest. If you decide you would like to seek medical attention you can go to the Ubud Medical Center on Jl. monkey Forest, Ubud which is less than 2 miles away. Office visits are about US $30 and you can walk in without an appointment. World Nomad Travel Insurance – You can never be too safe. Get travel insurance. 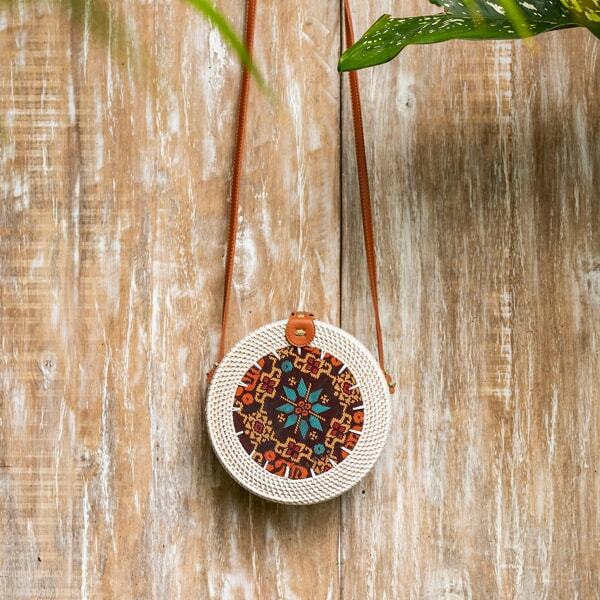 I use and can recommend World Nomad. Medical disclaimer: This information in this email is provided for informational purposes only and not intended to replace a one on one relationship with a qualified health care professional and is not intended as medical advice. Liza Raymond provides information based on her experience and research to you and encourages you to make your own health care decisions based upon your research and in partnership with a qualified healthcare professional. Do not use the information provided in this email for diagnosing or treating a health problem or disease, or prescribing medication or other treatment. Always speak with your physician or other health care professionals before taking any medication or nutritional, herbal or homeopathic supplement, or using any treatment for a health problem. If you have or suspect that you have a medical problem, contact your health care provider promptly. Do not disregard professional medical advice or delay in seeking professional advice because of something you have read in this article.